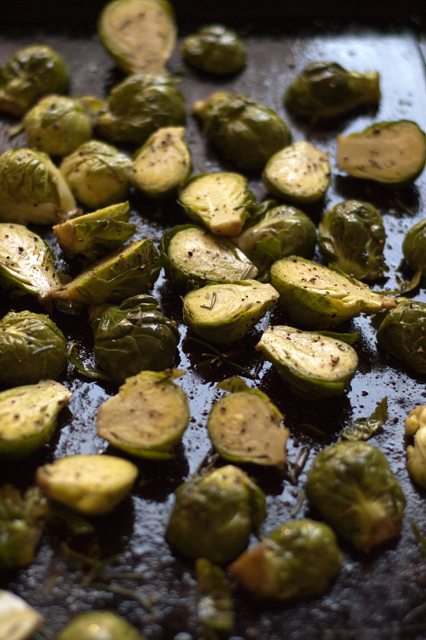 Roasted Brussel Sprouts and We’re Moving! That’s all I seem to be doing these days. Tom came home for only three days, then this morning he left for our new house. Yup that’s right, we are moving and its time for you to know where we are going! Sonoma County! Sebastopol, CA to be exact. In a little more than a week I will be taking morning walks through the old apple orchard next to my new house, breathing in the wet air from the ocean 20 minutes away and trying out my new wood burning stove! I never thought I would be lucky enough to move to such a beautiful place. Our joy is marred by the fact that we are moving so far from our friends. Neither of us knows a single person in Sonoma County and that’s kind of scary. I lived in the town I was born in for 25 years before moving away to college. Like most people, we made lifelong friends in college. Then we moved to San Jose where we made more lifelong friends. Now we are moving again and I just keep telling myself that there are more lifelong friends waiting in my new town. Its driving me crazy. Part of me just wants to jump ahead to next week. Just skip past the packing and the goodbyes. But I can’t! That’s all part of the journey. I remind myself to breathe and try to find a calm place inside myself. The easiest way for me to do that is to cook and take pictures. I focus on creating beauty from simple things, from what is ignored or consumed without thought. With a calm mind, a full belly and a camera full of promising shots I am ready to continue climbing over this mountain in my life’s path. I know there is a beautiful valley just beyond it. Just got to make it over. 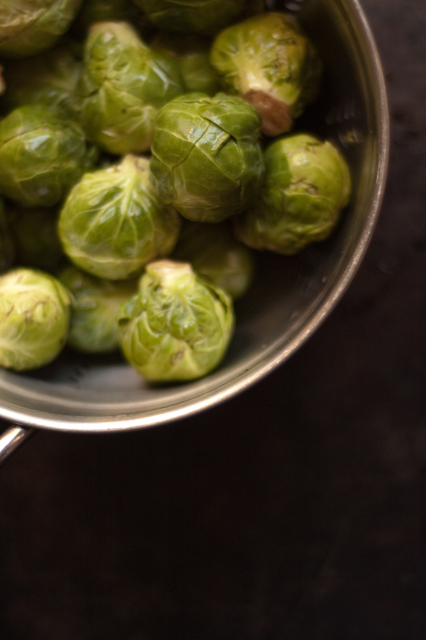 Brussels sprouts are a great example of a simple food that is usually ignored. 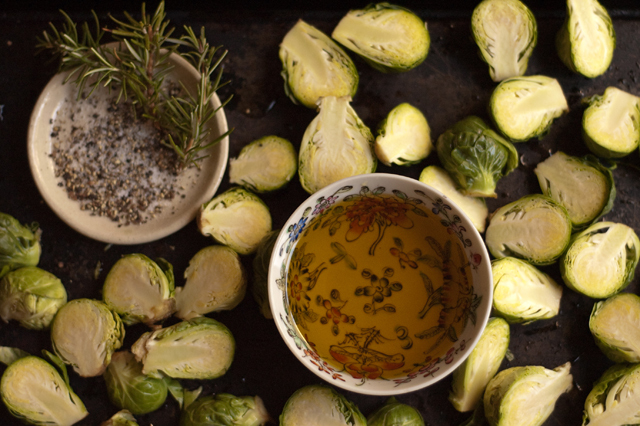 They are beautiful, in their own way, with tightly clamped leaves that turn a rich brown when caramalized in olive oil or butter. When cooked they are tender and mild, absorbing the flavors they are seasoned with. A perfect canvas for dressings or a sprinkling of cheese. 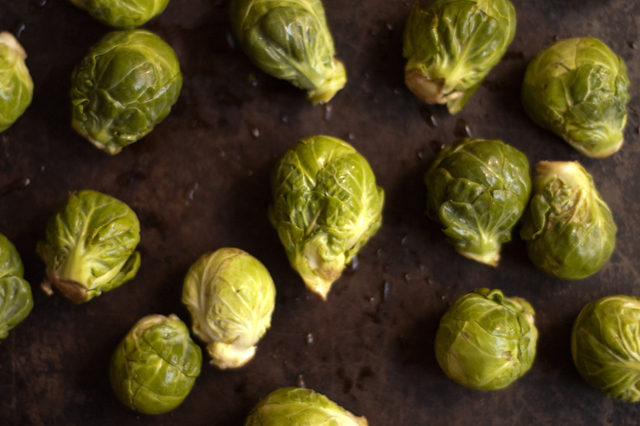 Fall is the perfect time to find fresh brussels sprouts in season. Look for small ones that are bright green, without any brown on the edges of the leaves and use them within a couple of days. 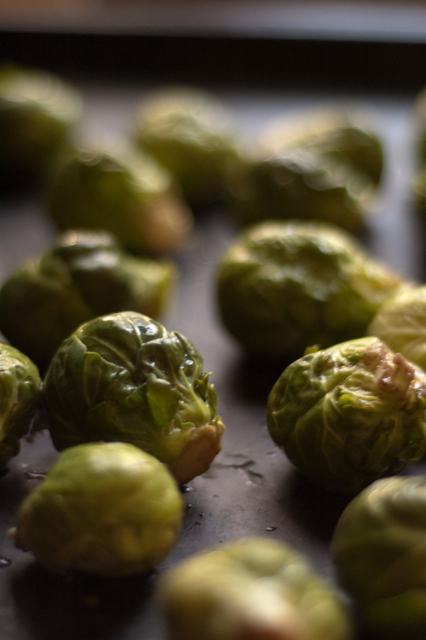 Any longer and they will develop an unappetizing sulfur taste and smell when cooked. 1. 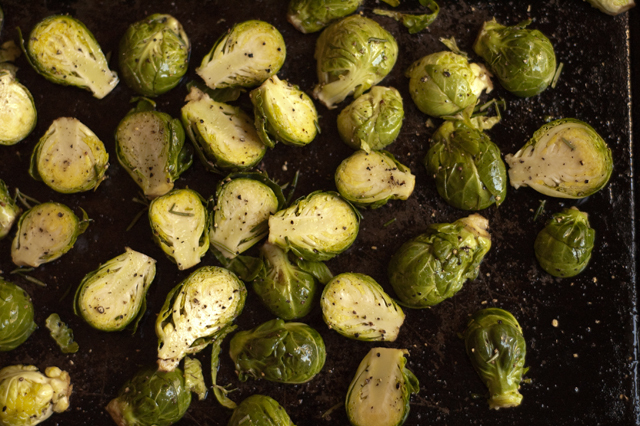 Preheat oven to 350 F. Clean brussels sprouts in a strainer. Slice in half. 2. Pour about 1/4 cup of oil into a zip top bag with the salt, pepper and chopped rosemary. 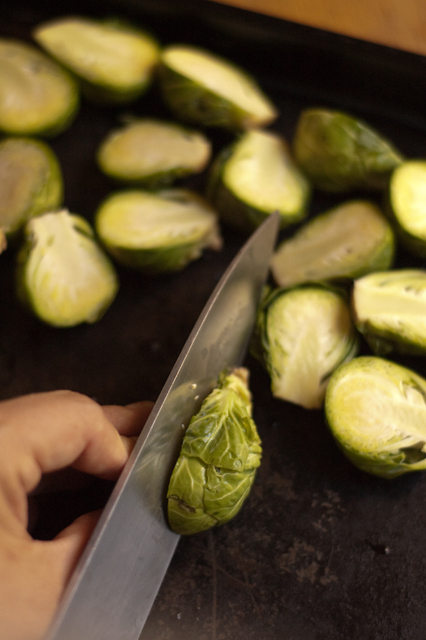 Add brussels sprouts, close and shake to completely coat the brussels sprouts. 3. 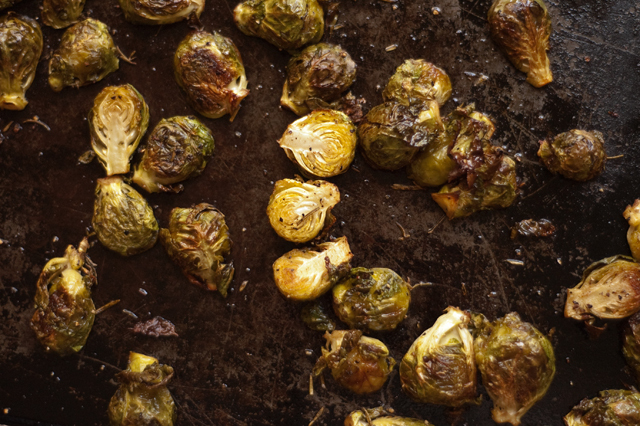 Pour onto an ungreased cookie sheet and bake for 25-30 minutes or until evenly browned. Stir every 15 min during baking to ensure even browning. 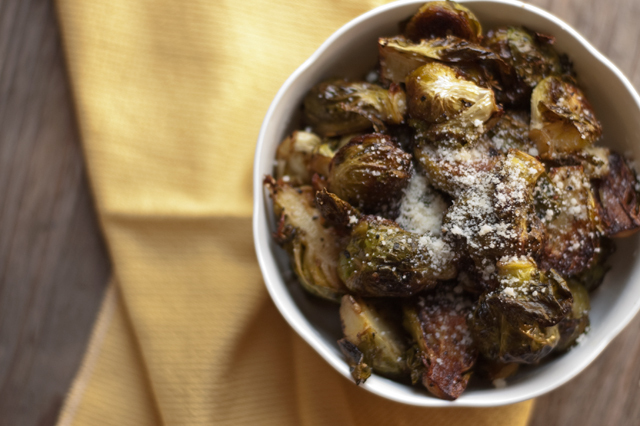 When done, sprinkle with Parmesan cheese and serve. Serves 4. Wow – good luck with the move, and happy housewarming! I stopped in Sonoma once – a long time ago. My only clear memories were of blistering heat (I think it was August and I’d never experienced anything like it) and a divine farmers’ market with wonderful cheese. What a beautiful part of the world. I hope it all goes smoothly for you all. Yummo. 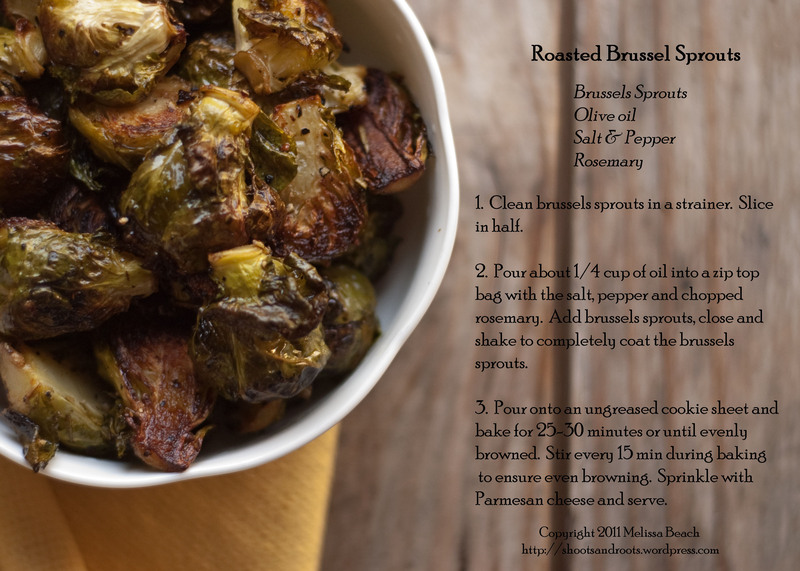 I absolutely love brussel sprouts. I’ve never baked them, I suppose because I enjoy them so much steamed with pepper that I haven’t bothered. I will now though. I have never had them steamed. I am going to have to try it.